Hey Everyone! I'm so excited to bring you a guest post from someone I spend more time with than my husband, and who keeps me sane - the medical assistant I love the most, Taylor. I'm really lucky to work with someone who is also one of my best friends, and we have SO much fun. She also is one of the most positive people I've ever met, and she puts up with my (occasional) stress and negativity so well. I'm so proud (and sad) that she's decided to pursue becoming a PA, and I think you'll gain a ton of knowledge by following her journey here! This one time we dressed the same for the Christmas party completely on accident! Hey there! My name is Taylor and I work with Savanna. I have been working in the medical field for almost six years now, and as a Medical Assistant for four years. If you were to ask me in high school what I wanted to be when I grew up, the answer was always the next Katie Couric. Friends actually signed my senior yearbook with “Can’t wait to see you on The Today Show!” I come from a family with zero medical backgrounds, and honestly I was never interested in medicine. Flash forward to my senior year of college in 2010, and realized I really don’t see myself having a career in PR. I was one semester away from graduating and wasn’t sure what I wanted to do with my life. I moved to a new city and started to look for PR jobs with non-profits. After several months on the job search, and a quick stent at my favorite quick-service restaurant (let’s just say ‘my pleasure’ is forever engrained in my head), I came home to my roommate telling me I had a job interview with a local dermatologist. This is just one example of one of the most valuable lessons that I have learned post-college - networking is everything. This roommate worked at a hair salon where my new boss had her hair done, and mentioned that she was looking for a new hire since her receptionist just got into PA school. Always be on the lookout for opportunities to network! I asked my roommate what the job entailed, and she had no idea. All I knew is it sounded somewhat interesting, and I knew I wanted a change of scenery. I went into the interview, and the first question they asked was “Are you okay with blood?” I responded with a cautious “Sure?” The office manager proceeded to tell me the different responsibilities of the job, and the tasks I would be doing. I started off mostly as a front desk receptionist, and worked with the physician one morning a week so her medical assistant had time to do paperwork and catch up on other tasks. After a few months on the job, I could see that being in back with patients, interacting with them, and learning about dermatology, was the most enjoyable part of my job. A few years later, we hired a Physician Assistant and I became her full time medical assistant. This was as far as I could move up the ‘totem pole’ at my job, and for several months was satisfied with where I was. For someone who had no experience in the medical field, I found it very intriguing and could see why people would want this career. When I first started this job, I knew being an MA was not something I could see myself doing my entire life. For several years I thought about possibly going back to school, but to be honest, it scared me, and I thought it would be too much. One of my greatest weaknesses is my love of comfort. I was comfortable with where I was. I knew what was expected of me and knew my job and could do it well. If you're struggling with deciding if this is something you can do, i hope Taylor's story and insights have provided some encouragement to keep pursuing your dreams! Leave any comments or questions for Taylor below! And if there's anything else you would like to hear her perspective on, leave a comment! Healthcare experience (HCE) has become one of the biggest factors that PA schools look at, and some of the requirements are pretty high. 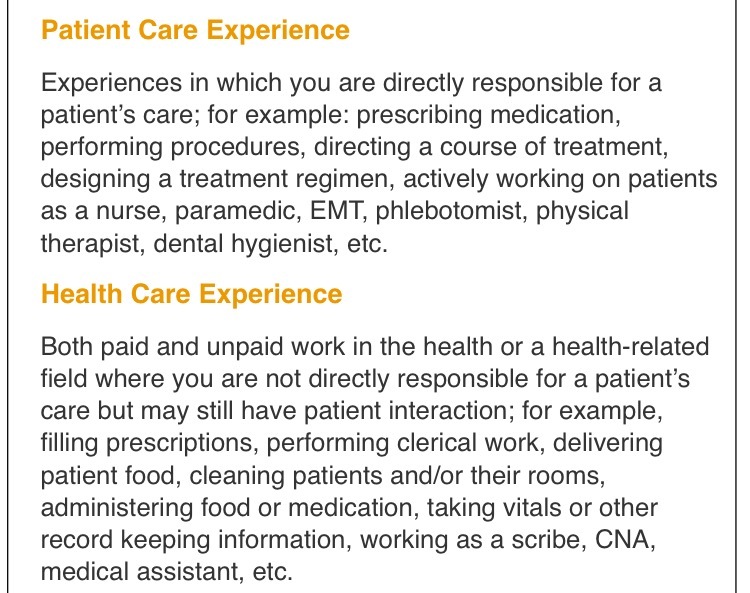 For most programs, you're going to need "direct patient-care experience." This usually does not include shadowing or volunteering, although some require these types of hours as well. It is not uncommon for programs to want at least 1,000 HCE hours. About 1 year of full-time work will be about 2,000 hours just as a reference. Before you decide to spend some money and time on any kind of training to get HCE, check with the programs you are interested in to be sure it will count. There will occasionally be occlusions of certain jobs that you think would possibly count, or the opposite can be true as well. The program I attended (Georgia Regents) actually accepted hospice volunteering hours as direct patient care, which was nice because it was free. To become more competitive, I recommend doing some kind of formal training, unless you are able to find a position where they are willing to train you on the job. Occasionally, you can be trained as a medical assistant, scribe, or patient care assistant, but more often than not, you will have a better chance at getting a job if you are certified. My high school offered an awesome program where you could become a CNA (Certified Nurse Assistant), and unfortunately I did not take advantage of this. If you are starting out early, good for you! And take advantages of any training you can get as soon as possible. Being that I still needed some experience, I decided to enroll in a CNA program. These typically will be either condensed over a few weeks during the day or at night or spread out to accommodate different schedules. I attended the program every Saturday for 3 months during my sophomore year of college, and did the clinical week during my Spring Break. Not my favorite Spring Break, but totally worth it in the long run. It was a few hundred dollars unfortunately, but I made it back working full-time during the next summer. I got a job as a CNA in a rehabilitation hospital and it was a great experience. Looking back on that experience, it's made me question why PA programs would want you to have any healthcare experience, let alone thousands of hours. My husband is a 4th year medical student and he didn't have to do anything like that at all! I think by doing tasks that are sometimes not the most fun, it reinforces the teamwork aspect of being a physician assistant. Once you are practicing, you will have such a greater appreciation and respect for the CNAs, medical assistants, EMTs and nurses because you have been in that position yourself and you realize how important they are. I remember working as a CNA and the physician coming to find me to ask if I had noticed any changes in a certain patient because I spent so much more time with the patients than the actual providers. And that's ok because they have a lot of people to take care of, but it really opened my eyes to just how much better healthcare can be if you approach it as a team effort. 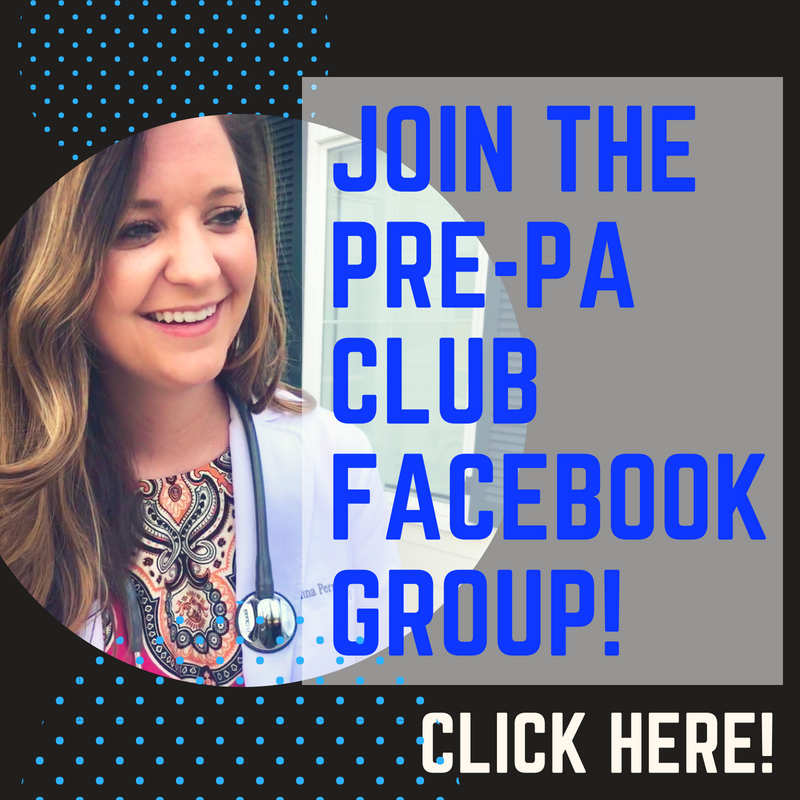 Here is a great blog post with examples of what actual students did for healthcare experience before starting PA school. 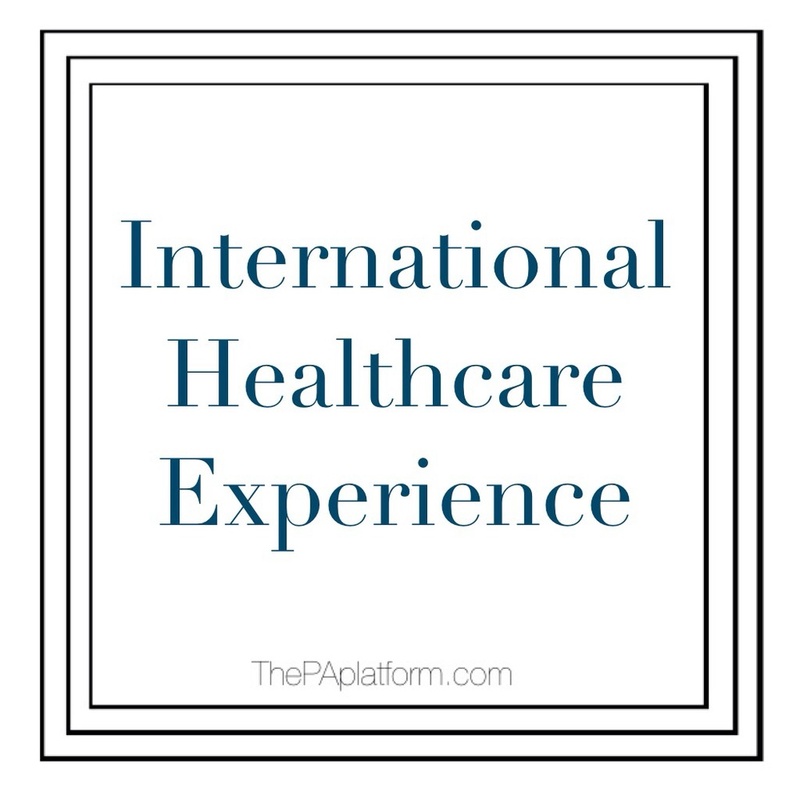 What are you doing to get your healthcare experience and how many hours are you applying with?